The Led Lenser SEO7R has a RED LED function. It's a few button presses to get into and out of that mode but that's no problem if that's the one you're mainly using. I avoid using the lights where possible but sometimes it's unavoidable or just easier to use it and readjust your eyes. I would look at the LED Lenser range. I have a SEO7R. It is perfect for what i use it for. Beach and Boat Fishing. It's light weight, rainproof, easy to use (different modes and adjustable beam), rechargable with the option of putting in AAA batteries if you run out while you're out and don't have a charger. I also have a Petzl NEO that is slightly heavier but more comfortable with the head strap arrangement. I use the petzl Neo if im wearing it constantly without taking it off. I use the Led Lenser if i'm using it occasionally and putting it in my pocket in between. A few things to think about in detail and what your priorities really are. What is your application and what are your prioities? Beach/Boat fishing, walking to fishing spots etc? If so then brighter/stronger isn't always better/necessary. The SEO7R is good for this application. Figure out how important weight/comfort are, the SEO7R is very light. Do you really need 300m range? Are you spotlighting/hunting/searching with it? If not then the power might be a hinderance, especially for your mates or for close range work. If you do need the range maybe look at the Led Lenser H14R.2. It's a bit heavier but has a full head harness. It is more than your budget (about $220) I have a friend that uses one hunting and likes it. If your budget is 3.5 times what you stated you can look at the Led Lenser XEO19R. It has 300m range and all the gadgets. I have not seen one in real life. I got bit by a live one a couple of years ago on the breakwall at Port Mac. It was about 6kg and i stuck my hand inside it's mouth to try to quickly grab and remove the hook inside it's mouth because i was in a hurry to get my hook back and cast a new bait while the school was there and didn't want to have to get my pliers out of the bag . The fish wash about 6kg. Lots of blood and a bit sore. I have been bitten by dead fish on more than a few occasions over the years. I'm sorry to hear about your experience with shimano, I have had nothing but outstanding after sales service from shimano the entire time i have fished and will not buy any other brand reel (except my handful of Alveys for their specific purposes). With regards to your reel, I would suggest trying to undo the screw that holds the line roller in and try to re-seat the bail arm in that collar to get it as flush as possible and see if you can close the gap as you re-tighten the screw. You could also look at adding the epoxy as described. Looks good, I like DIY. I would consider just making the dacron a bit longer and attaching it straight to the sinker loop to leave out the snap and swivel. If you want to continue with the DIY jig then you could snell some tinsel or feathers to the throat of the snapper lead so it looks like a bucktail jig or add reflective or lumo stickers. If you're getting snagged maybe consider having the hook a couple of inches above the sinker. Out of interest, does that mean you can't drive a boat over 15m with a general boat license? Even private one? So the guys that own the larger game boats would in theory have coxswains tickets? This could easily be the case, ours has the same problem so we stop/slow down periodically to refresh the water in the tank. You can install pickups to gather the water as you drive but be mindful of how you do this so as not to create a situation that might break part of the pump or rip a hole in the back of you boat to let water in if you run over something. I would say the tank was overcrowded in this case even if the pump was working. That one on the left is easier to get the rod in and out when you have a fish on. They also make them adjustable (adjust both vertical and horizontal angle). You still get a port and starboard one. I use them all the time for anchored or drifting. Just be mindful of how much drag you have on, I wouldn't have a kingy outfit locked up for example. The weld from the rack to the post is what bends. If you do get a fixed one you can gently bend the weld but i would get an adjust able set. i owned fixed ones for years before the adjustable ones came out. Some of the big marine suppliers stock them. Just be careful putting lighter outfits in there, how they sit. Those holders are designed to hold your rods parallel to the water. I do not ever drive with rods in them. There are a few huge black rays that live around there. Probably one of those. Jackets can be anywhere and you only need one in the water to bite the line. Puffer fish and toad fish can do the same thing and there is a chance if you were drifting or wining in that a little tailor has had a snip at your leader knot or even something that has got caught around your line like a little bit of weed or debris. Especially if the line is moving or twitching in the case of the jig head, slug and squid jig. You're other possibility is there is a tiny fracture on one of your guides that is causing damage to your braid or the braid has rubbed on something sharp at some stage in its life and is giving up under the slightest pressure. Frank, Just to exhaust all suggestions no matter how simple, have you checked if the motor is slightly in gear or is something a little stuck in the throttle lever or gear box? so the motor thinks it is in gear so it won't try to kick? I had this happen many years ago. I was trying everything and so I clunked the gear stick in and and out of gear forward/neutral and reverse a couple of times and it went. Most key start motors will have a safety system like automatic cars that wont let it try to start if it is in gear. The other one as mentioned by others was, is the killswitch (safety killswitch on the little cord) misbehaving or not engaging properly? You might be able to check if the motor is actually in gear by trying to spin the propellor with your hands. It should spin freely in neutral but wont if it is in gear. This will only tell you if the motor is actually in gear, not if the switches are just confused and they think it is in gear. I think if you are interested in it, will use it at least semi regularly and have the cash to spare then it is worth it. I have one and think it is great when i am actually able to get out. You really need to look at it several times a week whether you are going fishing or not just to keep track of what the water is doing where and compare that to what reports are coming in. Also don't assume you are going to be able to get clear scans everyday you want one. More often than not cloud cover is an issue and i end up looking at the Multi Resolution Blend image which is a blend of a few scans over past days. You will also want to learn to understand what and how Altimetry works and how that relates to the currents. Burley with chicken pellets and fish scraps. Don't only use bait jigs for the livies. Have one guy use a bait jig, firstly with no bait (avoids unwanted fish like sweep and mados), then try a fleck of prawn or pilchard on every second hook. Have another guy with a hand line or light bream rod with a small long shank hook (anywhere from a size 6 - size 1) with a small split shot about 30cm above it. If you dont have split shots you can use a small ball sinker held up with a little bit of rubber band. Use a small piece of prawn or fish flesh (better) on the single hook and flick it out the back of the burly cloud (5-10m from the back of the boat) and let it waft down naturally. Often the rubbish fish and yakkas will hold hard under the boat and burley and the slimies will be out the back. If you dont put a bait out there you might think there are no slimies. 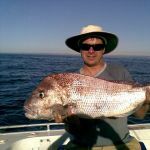 If you troll metal lures, small squid skirts or diving lures along the back of the wash from the south head of the harbour down along in front of the lighthouse towards Ulladulla Bommie you will be a chance at an Australian Salmon, Tailor, Bonito, Kingfish. Be careful of shallow rocks/reefs and occasional breaking waves in all of this area. There are alot of bommies that break occasionally and are very shallow. Don't be afraid to have a livie out anywhere you are fishing with a chance of a king or Mako.